Are you a dog person or a cat person? Us, we’re totally dog people! 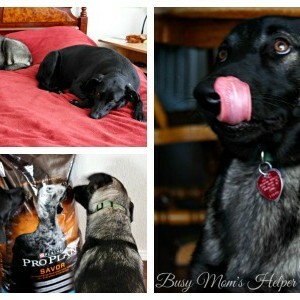 We have two fabulous pups in our family….Kita (black lab mix) and Tula (lab/retriever)….who we love like crazy. That being said, there’s days when they drive me so crazy I fantasize about locking them out back and ignoring their whimpers as they press against our back door, drool dripping down the glass. Luckily, they’re cute and lovable, and come with some hilarious stories – like about The Vacuum that Saved my Dogs! Plus – a tasty Peanut Butter Dog Treat Recipe! Dogs shed. Yes, I know that’s common knowledge, or should be – but our retriever mix sheds A LOT! We sweep daily and our wood floors still look like they’re growing a layer of fur. Our carpets have no black and grey in them, but they sure look like those colors are mixed in with all the dog hairs! I’ll admit, it’s gotten so bad I’ve been tempted to find a new home for Tula…I don’t know if I ever really could, but the thought’s crossed my mind when I’m vacuuming and sweeping like crazy. Lucky for her, though, we got the Eureka Brushroll Clean™ with SuctionSeal® and it’s AMAZING! You can actually TELL when we vacuum by the visible difference….. Yes, we vacuum regularly – but our old vacuum obviously wasn’t doing a very good job! We wanted to test it out so we went 1 week without vacuuming, then went over our entire upstairs (loft, 3 bedrooms and a little hallway and landing area) with our old vacuum. Wait another week (during this time get the new Eureka Brushroll Clean™ with SuctionSeal®) and try our new one. Here’s the difference of what it collected…. Yuck, right?! The one on the left is, of course, the new and our old crappy vacuum is on the right. What a difference! We didn’t do anything different between the 2 weeks (except waiting that long to vacuum, which I swear isn’t normal). And guess what? The plate on the left, done with our new vacuum, isn’t even from the entire upstairs – just the loft! We couldn’t fit anymore. Yup, this is going to save my dogs for sure – and probably my sanity, as well! And did you know that the self-cleaning Brushroll technology takes just a press of the button, and it quickly removes dirt, debris and all that tangled mess from the rollers in like 10-15 seconds. We did this several times while vacuuming, and were blown away by how well it worked! The pull-out cord is another life-saver…of my children! I hate when you’re vacuuming, and they think it’s a game to jump ‘over’ the cord. Of course they end up missing sometimes so you get jerked back suddenly. Argh! With this one you can just pull out more cord as you go, so you don’t have tons to hassle with. Love it! You can grab these at Walmart. In fact, we were there Saturday and when the kids saw it they’re like ‘that’s Mommy’s new vacuum! The one that works!’ Yup, even the kids know how awesome it is. Now instead of getting frustrated with the ‘mini-dogs’ of fluff all over my house, I’m back to just being happy with my dogs and making them treats! Preheat oven to 350 Degrees F. Spray or line a baking sheet, set aside. Mix the 3 ingredients together until well-combined. Scoop into 1″ balls, then place on the prepared baking sheet and press down slightly. Bake for 17-20 minutes. Allow to cool, store in the refrigerator. Our dogs LOVE these treats! Look at the photo on the far right….Kita is licking her chops when she sees Tula getting one of the cookies! 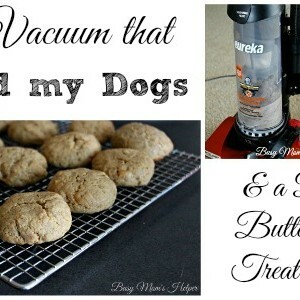 It’s hilarious that this vacuum does amazing at cleaning up after all the dirt and dog hair in our carpets – yet the dogs think it’s a monster! Check out Kita in the pics below, staying just a couple feet away as Hubby vacuums. Every now and then she’ll lunge for it….she’s such a nut! What area of YOUR house would benefit the most from the Eureka Brushroll Clean™ with SuctionSeal®?